Many unqualified performers are solicited to provide drainage systems because their approach is less expensive, quick and focused on resolving an immediate concern but, few understand the dynamics behind the sound engineering principals that are required in providing you absolute results and long term solutions. Storm water that becomes deposited along a home’s foundation, as part of the roof gutter downspout system, will need to be connected to a surface drainage system that can carry the water away from the home. As the soil becomes saturated a condition will develop that will exceed the capacity of a given soil’s texture to hold water (cohesion) and depending upon the classification type of the soil (Clay, Silt, Sand) the excess water will begin to migrate. This “free water” condition can allow water to penetrate through solid concrete slabs, foundations and crawlspaces. In the selection of the type of piping, as well as the application of products that are going to be made part of the life expectancy of a drainage system, the sustainability of the piping network to ward off root intrusion and sedimentation deposits, requires knowledgeable planning. In providing drainage solutions, good planning can allow you to marry a knowledgeable approach to the details for construction, that are necessary in providing successful solutions. Please take a few minutes and view the video presentation below about our approach to providing landscape drainage. In planning for a network of pipes and Catch Basins that can accomplish this, a plan for action needs to anticipate both the roof’s square footage’s area together with the landscaped area’s potential influence. Drainage systems have become a part of landscape construction and design with swimming pool construction but, without a good plan and a set of specifications that are anchored in knowledgeable understandings you can easily get soaked and still be left with problems. The key is to start with a properly planned direction and allow this information to provide the calculations that will afford you a lasting solution. ePoolscapes.com has been designing and installing landscape drainage solutions with the historical evidence of success through the floods of 86’, 95’ and 97’ throughout the area. Our approach to providing landscape drainage solutions is to perform a site specific assessment for the potential watershed area’s storm water yield and or irrigation runoff and bestow an anticipated level of drainage capacity to our clients that is commensurable with the results of such calculations. 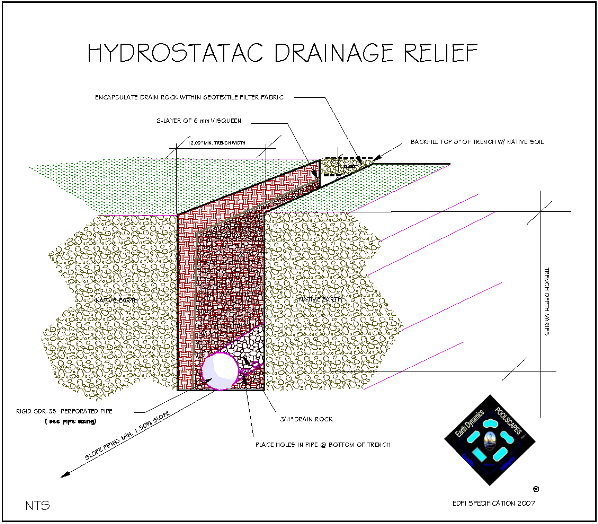 We utilize the manufacturers published values for both hydrostatic relief systems and surface in-flow capacities in order to establish our committed, design criteria in writing, prior to starting any drainage project! 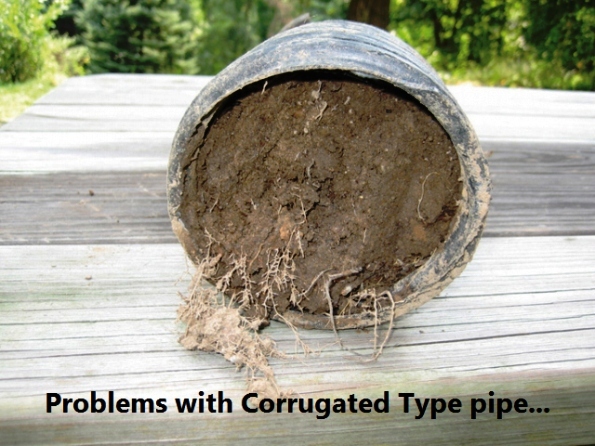 Successful landscape drainage planning should start right from the first source of influence. Some performers will just “wing it” and approach drainage in a fashion undeserving of your hard earned money and expectations. That expectation should be that, when you hire a professional you expect to get a professional result but, if you fail to evaluate the potential for the selected performer to deliver on a promise, well what you may get, is disappointed! 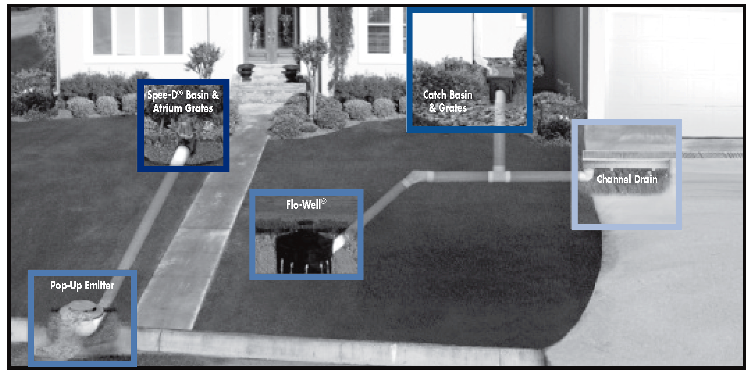 Well planned drainage systems and irrigation systems are the foundation of a maintainable healthy landscape. The maturity and longevity of your landscape improvements are tied directly to these two contributing factors. Drainage systems must be planned, they should be serviceable and they should be designed for the site specific requirements regardless of the size of a residential property. Calculations for the in-flow and discharge volumes must be known in order to call out the piping network and collection system sizes and capacities. Being a leading drainage company for over 30 years, ePoolscapes.com professionally engineers every one of our drainage systems, custom tailored to our clients’ unique needs. The sour taste of low-quality lingers long after the price is forgotten! If you are speaking to a contender about the installation on your drainage works and they cannot provide this type of information about a proposed direction, you might be speaking to the wrong person for the job. 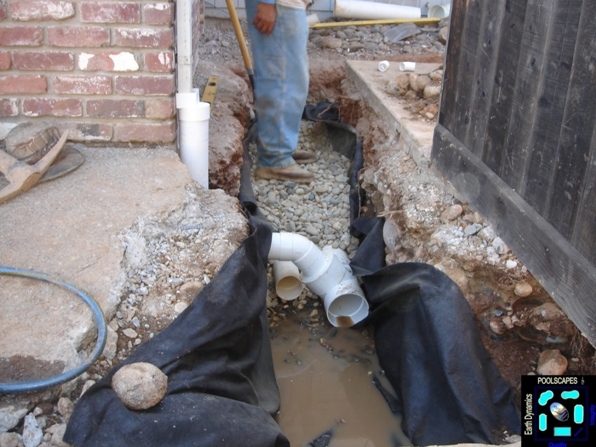 Our approach to solving drainage issues is to make you the beneficiary of a well planned approach. We understand the value of this service, especially when good planning can head-off thousands of dollars in costly repairs from water damage due to unanticipated periods of peak storm water flows. Can you explain the type of existing drainage...?